Red clover (Trifolium pratense) has traditionally been use in herbal medicine as a blood purifier but in recent years has been popularized for its use in reducing menopausal symptoms. While there are a number of studies supporting its use for menopause, its effectiveness is based on isoflavones and efficacy is dependent on whether those consuming it can convert the isoflavones formononetin and daidzein into the more active equol. This topic is addressed comprehensively in the AHP monograph and can help consumers and health practitioners understand why it may or may not work. Another issue of particular interest is the topic of phytoestrogens, a very misunderstood category of botanical activity that is of significant relevance to those with reproductive cancers that may wish to use red clover and its preparations. As red clover has a long history of use in cancer care, concerns regarding phytoestrogenic activity have been raised. This issue is also fully addressed in the Therapeutic Compendium and is of value to customer service, marketing, education, and research and development departments. 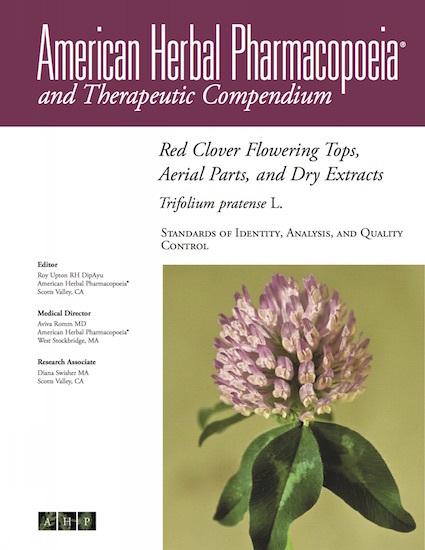 Red Clover Monograph and Therapeutic Compendium is one of the most beautifully esthetic of all AHP monographs developed to date.